Looking to switch up your slaw game? 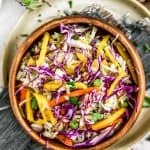 We’ve got you covered with this super refreshing, flavorful, and healthy Asian Mango Slaw. Crisp jicama, nutrient-packed cabbage, sweet mango, zesty onions, and spicy jalapeño all tossed in a amazingly light, tangy Asian sauce. Brighten up your Asian tacos and burgers with this wholesome slaw. This vibrant, colorful salad is super easy to make and a fantastic dish for picnics and gatherings. Place all the dressing ingredients in a small bowl, whisk to combine. Set aside. Place the jicama, coleslaw mix, red cabbage, mango, green onion slices, and jalapeno in a bowl, toss to mix. Drizzle the dressing over the mixture and toss to combine. Taste the coleslaw, add more seasoning if desired. Serve as a delicious side salad, on tacos, in a sandwich or wrap. *Nutritional Information: Does not include optional add-in of toasted sesame seeds.